While loop is also known as a pre-tested loop. In general, a while loop allows a part of the code to be executed multiple times depending upon a given boolean condition. It can be viewed as a repeating if statement. The while loop is mostly used in the case where the number of iterations is not known in advance. Let's see the simple program of while loop that prints table of 1. A conditional expression is used to check the condition. 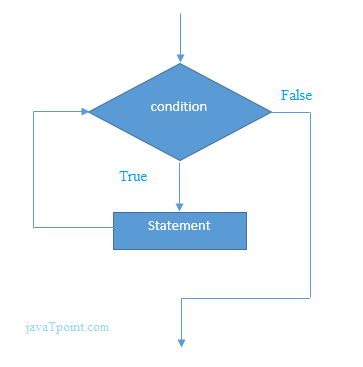 The statements defined inside the while loop will repeatedly execute until the given condition fails. The condition will be true if it returns 0. The condition will be false if it returns any non-zero number. In while loop, the condition expression is compulsory. Running a while loop without a body is possible. We can have more than one conditional expression in while loop. If the loop body contains only one statement, then the braces are optional. If the expression passed in while loop results in any non-zero value then the loop will run the infinite number of times.